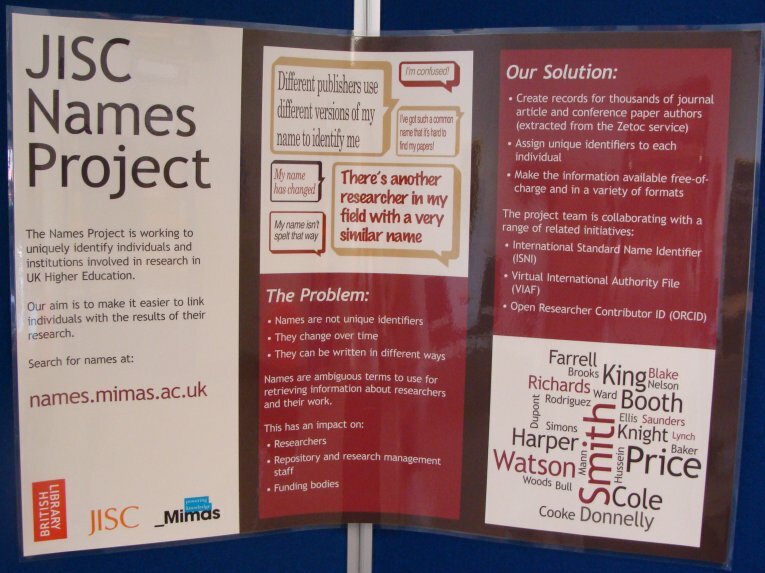 The JISC Innovation Forum (JIF2010) at the Royal Holloway University of London presented the project team with another great opportunity to demonstrate the Names prototype while periodically stuffing ourselves with free food. I personally left JIF2010 with a notepad full of new contacts and a handbag full of mini blueberry muffins (which didn’t survive the journey home). The event itself focused on the key tenets of innovation – openness, collaboration, and user involvement – which collectively foster creativity and encourage overall sustainability. Delegates were given the chance to learn about other JISC projects through interesting project showcases and jazzy exhibition stands. Innovative ‘Thunderbolts & Lightening’ sessions enabled audience interaction and facilitated idea sharing (which resulted in some impressive illustrations!). Other hands-on sessions focused on project management, community engagement, and sustainability and access. I attended sessions on ‘writing to get your project noticed’, ‘promoting your project to different audiences’ and ‘engaging with communities – social media and networking’ during which I picked up some useful tips and practical advice on identifying and delivering to target audiences. The event wrapped up with a talk from Professor John Potter who emphasised the significance of effective leadership, negotiation and collaboration within the higher education environment; all crucial endeavours in these uncertain times.